Editor's Note: The author would like to thank Scott Coral of Greg Donahue Collector Car Restorations, Inc. for his assistance with this article. Has your padded steering wheel seen better days? 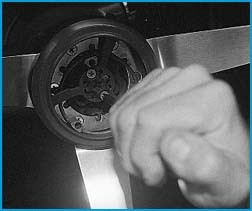 It seems that universal vinyl wraps or duct tape seem to be the most common way to repair these steering wheels. Not any more. 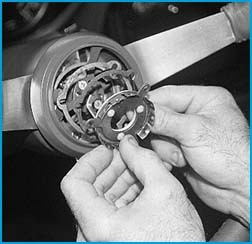 Zip Products has a padded steering wheel restoration service available. The original Corvette steering wheels are stripped and restored to original appearance using all the correct leather, colors and stitching patterns. If originality is not a major concern, they also offer a Lecarra three- or four-spoke leather wrapped steering wheel. 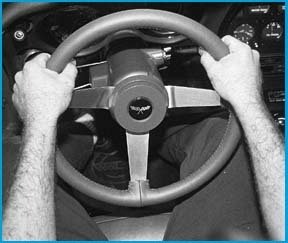 Our project '77 Corvette needed a new padded steering wheel, so we contacted Zip for all the needed parts. 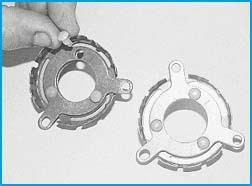 The replacement is simple and can easily be done in one afternoon with simple hand tools. We will also illustrate how you can freshen up the steering column and attach parts so everything will have that new look. First, disconnect your battery. Then remove the horn button. It will pull off quite easily. Remove the three screws holding the horn contact in place. Also remove the contact shims. These vary from car to car. Some Corvettes only have one, others may have two or three. The screw securing the center star can be removed. Then remove the center star, telescopic lock and spacer. 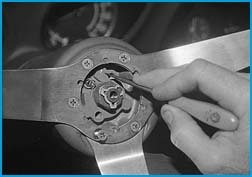 Mark the position of the steering wheel and collar so you will be able to reassemble the wheel back into its present position. The screws that hold the steering wheel to the collar can now be removed. When this is done, you will be able to remove the steering wheel and extension collar. Since we wanted everything to look as good as our restored wheel, we decided to refinish all of the steering column pieces. We started by masking off the horn button center emblem. Use two-inch masking tape to cover over the emblem. Then take a single edge razor blade and cut around the emblem. Voila! An instant cover. Use a scuff pad or 600-grit sandpaper to scuff up all of the parts to be painted. After the parts have been scuffed, use 3M's General Purpose Adhesive Cleaner No. 08984 to wipe them down before painting. We used PPG Duracryl Interior Lacquer to respray our column and steering wheel parts. Check with your local PPG dealer. Most of the colors are available. The column also needed to be refinished. We prepared it in the same manner as the other pieces, then masked off all of the surrounding interior and re-sprayed it. You can keep the overspray to a minimum by turning the pressure of the gun down to 25 to 30 pounds and use light overlapping strokes. When everything is dry, start the reassembly by installing the extension collar and steering wheel. Remember to line up your alignment marks. Now reinstall the spacer, telescopic lock and center star screw. Before you re-install the star retaining screws, check the telescopic lock. When you turn it to the lock position, it should lock the telescopic position of the wheel into place, and you should not be able to push or pull the wheel in or out. If you can, you are not getting a full lock on the telescopic lever. Realign the lever hole and try again. You want the telescopic lever to lock the column into place when it is approximately two-thirds of the way to the right. When you have achieved this, install the center star retaining screws. If your horn button does not work, this is usually the problem: One or two of the plastic rivets have broken, as you can see here, on the old contact. When this happens, a new horn contact is the answer. Reinstall the horn contact and spacers. Next, center the horn button and gently push it into place. Re-connect your battery and you are ready to go.